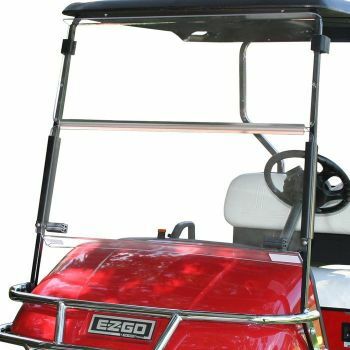 Deflect the wind and reduce sun glare with a Tinted Folding Winged Windshield for your EZGO RXV. Sun glare can make driving difficult but having a tinted windshield will help reduce the strain it can have on your eyes. The winged sides help redirect wind that can be bothersome to passengers. An additional feature is a gasket that fits onto the bottom of the windshield creating a seal between it and the front body cowl. But on those sunny days when a breeze is what you need, then conveniently fold the windshield down for some much needed air flow.